More than 150 people have braved sub-zero temperatures to spend the night on station concourses to support the Railway Children charity. In four of Britain’s major stations – Liverpool Lime Street, Manchester Piccadilly, Birmingham New Street and London Bridge – the hardy volunteers slept last night (31 Jan) in aid of vulnerable children who run away from home both in Britain and abroad. Network Rail and the wider rail industry teamed up with the Railway Children charity to raise money and awareness for the work being done which helps thousands of children every year. 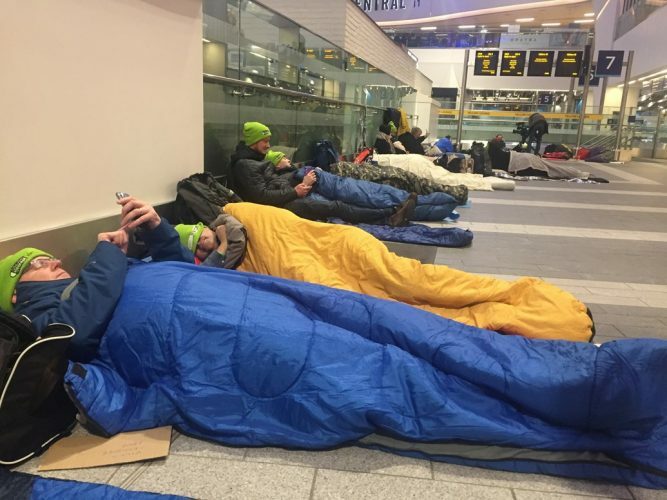 Directors from Network Rail, train companies, rail industry partners and politicians, took part in the sleep out, which was sponsored by Virgin Trains, to help raise £25,000 for the charity. The railway is one of the easiest ways to travel for runaway children, and this year the British Transport Police estimates it will deal with 10,000 child safeguarding incidents on Britain’s railways, a 20% increase from 2017/18. Martin Frobisher, Network Rail’s route managing director for the London North Western route, who spent the night at Manchester Piccadilly, said: “As an industry, with thousands of staff in stations across Britain, we are often the eyes and ears who can spot distressed children and young people and help get them the support they need. More than 150 people took part at the four stations including the Mayor of the West Midlands, Andy Street, at Birmingham New Street, and the Metro Mayor of the Liverpool City Region, Steve Rotheram, at Liverpool Lime Street.